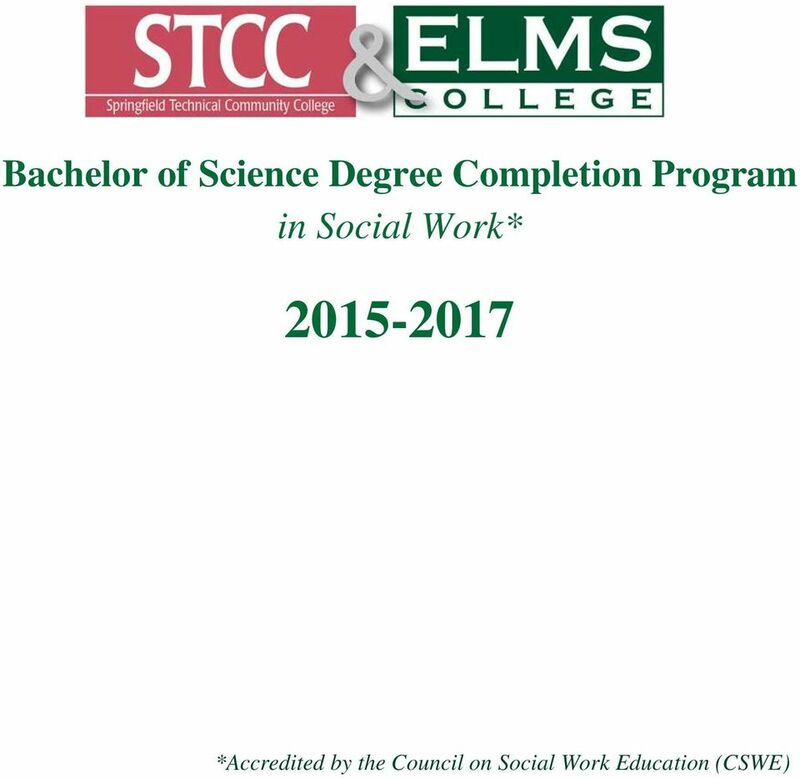 Download "Bachelor of Science Degree Completion Program in Social Work* 2015-2017. *Accredited by the Council on Social Work Education (CSWE)"
2 B.S. DEGREE COMPLETION PROGRAM IN SOCIAL WORK Program Prerequisites: an associate s degree from an accredited college with a minimum 2.5 G.P.A. Additional requirements: ECN-101 Economics; SOC-101 Introduction to Sociology; PSY-101 General Psychology; BIOL-102 Principles of Biology I; PHL-101 Introduction to Philosophy; HIS-110 Survey of U.S. History and Government or HIS-111 Survey of Modern U.S. History; Theatre, Art or Music. A college-level math is strongly recommended. Description: The social work degree completion program is designed for working people who already have an associate s degree. A bachelor s degree can be completed in 20 months with classes held 8:30 a.m.-12:30 p.m. and 1-5 p.m. Saturdays in 10, eight-week sessions, beginning in August Students will join a cohort and remain in that group throughout the program. Classes are held at on the STCC main campus in Springfield, in Building 13, or online. This degree program prepares students to take the state social work licensing exam at the L.S.W. level. In addition, graduates are eligible for advanced standing in many social work graduate programs. Job Outlook: Overall employment of social workers is projected to grow 19 percent from 2012 to 2022, faster than the average for all occupations, according to the Occupational Outlook Handbook edition published by the U.S. Department of Labor. Employment growth will be driven by increased demand for health care and social services, but will vary by specialty. Employment of child, family, and school social workers is projected to grow at a faster-than-average 15 percent from 2012 to Child and family social workers will be needed to work with families to strengthen parenting skills, prevent child abuse, and identify alternative homes for children who are unable to live with their biological families. 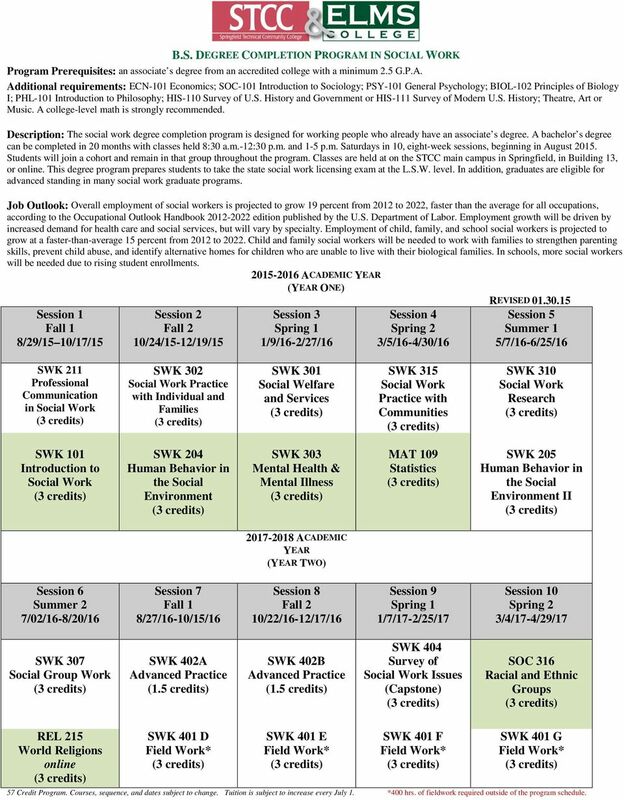 In schools, more social workers will be needed due to rising student enrollments ACADEMIC YEAR (YEAR ONE) REVISED Session 1 Fall 1 8/29/15 10/17/15 Session 2 Fall 2 10/24/15-12/19/15 Session 3 Spring 1 1/9/16-2/27/16 Session 4 Spring 2 3/5/16-4/30/16 Session 5 Summer 1 5/7/16-6/25/16 SWK 211 Professional Communication in SWK 302 Practice with Individual and Families SWK 301 Social Welfare and Services SWK 315 Practice with Communities SWK 310 Research SWK 101 Introduction to SWK 204 Human Behavior in the Social Environment SWK 303 Mental Health & Mental Illness MAT 109 Statistics SWK 205 Human Behavior in the Social Environment II ACADEMIC YEAR (YEAR TWO) Session 6 Summer 2 7/02/16-8/20/16 Session 7 Fall 1 8/27/16-10/15/16 Session 8 Fall 2 10/22/16-12/17/16 Session 9 Spring 1 1/7/17-2/25/17 Session 10 Spring 2 3/4/17-4/29/17 SWK 307 Social Group Work SWK 402A Advanced Practice (1.5 credits) SWK 402B Advanced Practice (1.5 credits) SWK 404 Survey of Issues (Capstone) SOC 316 Racial and Ethnic Groups REL 215 World Religions online SWK 401 D SWK 401 E SWK 401 F SWK 401 G 57 Credit Program. Courses, sequence, and dates subject to change. Tuition is subject to increase every July 1. *400 hrs. of fieldwork required outside of the program schedule. 4 organizational systems. 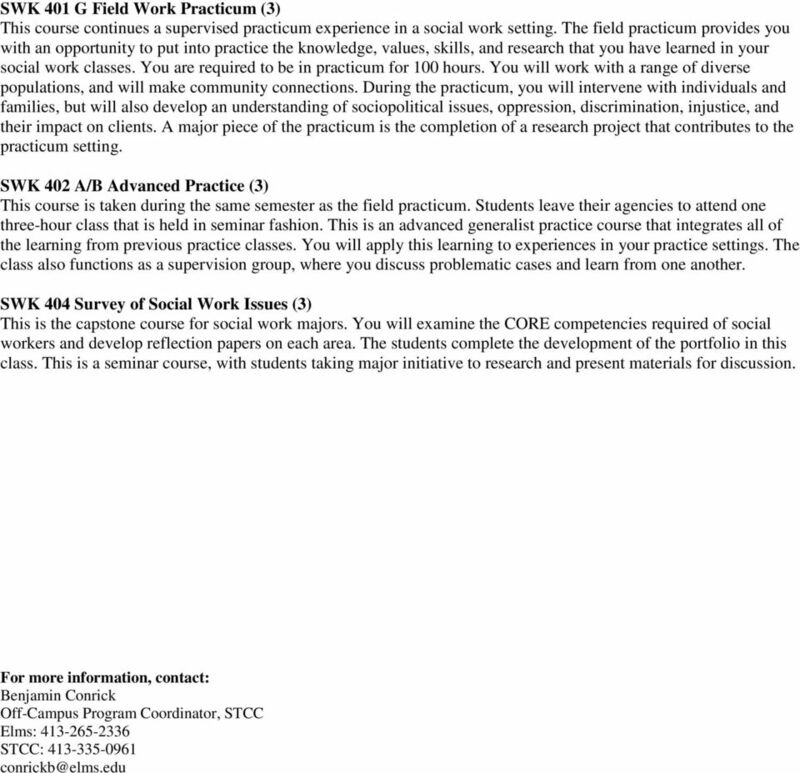 SWK 302 Practice With Individual and Families (3) This course introduces you to the generalist skills and values of culturally competent social work practice with individuals and families. Through lectures, role-plays, and video recordings, you learn how to interview clients and assess functioning and mental status, and how to engage clients in effective social work practice. This course also teaches specific practice skills with populations at risk, such as survivors of trauma, children, and elderly. SWK 303 Mental Health and Mental Illness (3) In this class, you are introduced to the history and study of mental illness. By using the Diagnostic and Statistical Manual IVR, you learn to understand and make descriptive assessments and diagnosis of mental illness, such as mood and psychotic disorders. You also focus on how race, ethnicity, gender, sexual orientation, age, religion, and other social variables can impact mental health. SWK 307 Social Group Work (3) In this course you are introduced to the theory and practice of contemporary social work practice with groups. During this class you participate in lectures as well as a semester-long experiential group. This class prepares you to provide services to different groups, such as adolescents, elderly, and ethnically diverse racial groups in a variety of settings. 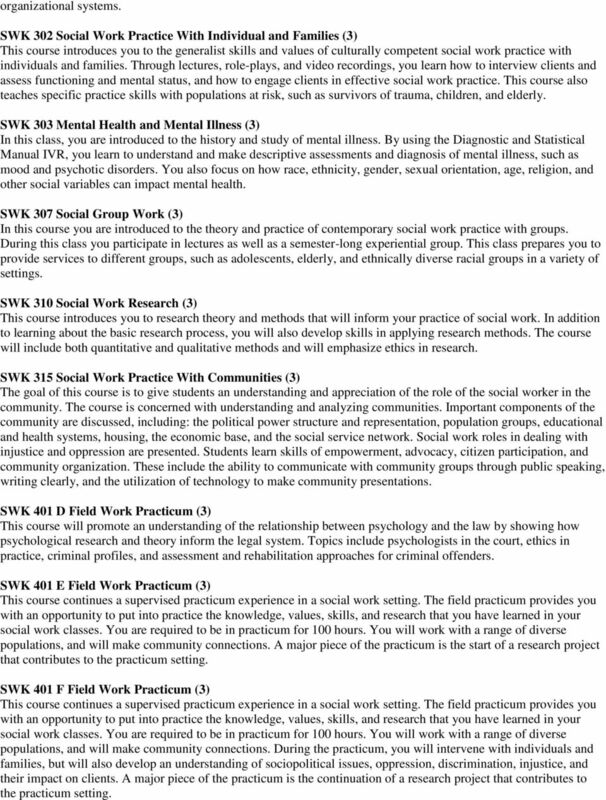 SWK 310 Research (3) This course introduces you to research theory and methods that will inform your practice of social work. In addition to learning about the basic research process, you will also develop skills in applying research methods. The course will include both quantitative and qualitative methods and will emphasize ethics in research. SWK 315 Practice With Communities (3) The goal of this course is to give students an understanding and appreciation of the role of the social worker in the community. 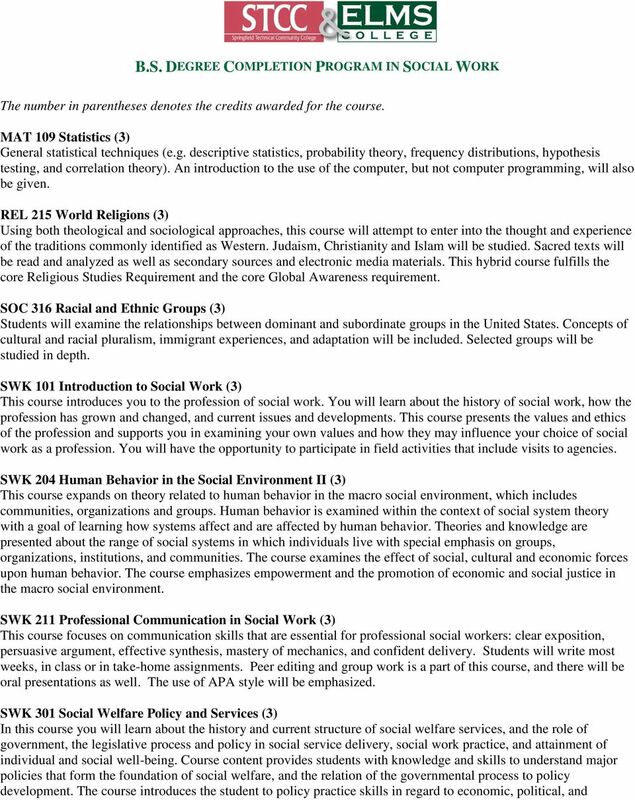 The course is concerned with understanding and analyzing communities. Important components of the community are discussed, including: the political power structure and representation, population groups, educational and health systems, housing, the economic base, and the social service network. Social work roles in dealing with injustice and oppression are presented. Students learn skills of empowerment, advocacy, citizen participation, and community organization. These include the ability to communicate with community groups through public speaking, writing clearly, and the utilization of technology to make community presentations. SWK 401 D Field Work Practicum (3) This course will promote an understanding of the relationship between psychology and the law by showing how psychological research and theory inform the legal system. Topics include psychologists in the court, ethics in practice, criminal profiles, and assessment and rehabilitation approaches for criminal offenders. SWK 401 E Field Work Practicum (3) populations, and will make community connections. A major piece of the practicum is the start of a research project that contributes to the practicum setting. SWK 401 F Field Work Practicum (3) populations, and will make community connections. During the practicum, you will intervene with individuals and families, but will also develop an understanding of sociopolitical issues, oppression, discrimination, injustice, and their impact on clients. A major piece of the practicum is the continuation of a research project that contributes to the practicum setting.